What is a featured post? One way you can enhance the visibility of a post is by making it a featured post. Each blog can have one featured post at a time, which will be "pinned" to the top of the blog above all other posts. That way, as you add newer posts to your blog, your featured post won't get pushed out of sight. Featured posts will be indicated by a pinned bookmark ( ) icon across from the post's title. While editing your blog, locate the post and click on its cog () button. Select Edit from the dropdown. On the Edit Blog Post page, toggle the Make it Featured Post post option. 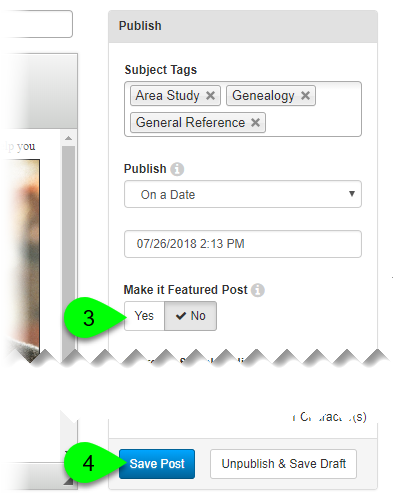 Set to 'Yes' for the post to remain pinned to the top of the blog. Set to 'No' and it will fall back into chronological order. Remember that each blog can have only one featured post at a time. Click the Save Post button.